How to Measure My Mirror? We Make Measuring Your Mirror Easy! HOW DO I MEASURE FOR MIRRORS? 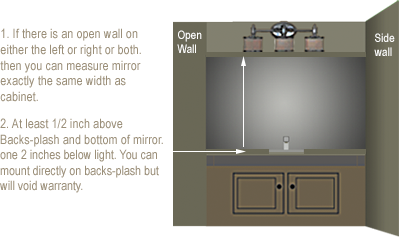 EXAMPLE: If opening is 60" inches wide and 40" in height, then subtract at least 2" each side inches in width and 3 inches in height. Perfect Mirror is 56" Wide & 37" in height or smaller. 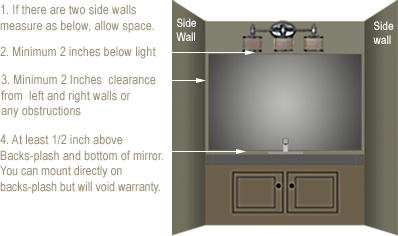 However, if you have an empty wall on one side, you can make the mirror exact wide of cabinet . No, measure framed mirrors and glass only mirrors the same way allowing space for side wall constraints. WHAT ABOUT TOWEL RACKS, MEDICINE CABINETS,LOW LIGHTS? If you have objects in the way, consider removing them. If you cannot, then you will need to make mirror smaller. Consider subtracting 3 or 4 inches from each side. Look below at an example. EXAMPLE: If opening is 60" x 40" and you want to subtract 3 inches for each side and make 3" inches below light and 1 inch above splash. Measurements would be 54" in width and 36" in height. Remember that , you cannot bend or change the shape of your mirrors. It will fit or will not. Use your best judgment when you have objects in the way.